Jonah here: Today we joined Madan and his family to deliver a truck full of rice, lentils, sugar and spices to the remote village of Kavre, his home village of about 500 people up in the hills. We started the day early at 7:00am, piling into a jeep and riding into Kathmandu’s center where there was a truck loaded with supplies waiting to leave. When we arrived, however, there was some sort of disagreement with the truck driver and he unloaded the entire bed and drove off! So we were left with a ton, actually more like two tons, of food and no truck to transport it. Madan and his friend set into plan-B and drove out to the edge of the city where there appeared to be a row of flat-bed trucks waiting for just such an opportunity. After some negotiations with a few different trucks, an agreement was made and the driver followed us back to the supplies. With a truck loaded up, for a second time, we finally headed out on the bumpy, winding road up into the hills. In the jeep with me, Norm and Anju, were Madan, his daughter, Pramila, her husband and their son, Madan’s wife and his mother along with his friend driving. About 2 ½ hours later, we reached the village by way of bumpy, winding, washed out roads and found a group of about 100 people waiting for us, standing in the sun at the edge of a hillside. Anju climbed up on the truck and began reading names off a list. One by one, people came up to the edge of the flat-bed, pulled 30kg sacks of rice off the edge, strapped them along with a few other supplies to their heads and headed barefooted or in flip flops back towards their homes. It was very moving to watch, to be witness to Madan and his friend’s selflessness. We shared crayons and pencils with the children. There were also a few older men who found their way to us, me and Norm in particular, and asked in Nepali if their names were on the list. We did not understand anything they were saying but we could tell they were angry. A young child came up beside me and explained in English what their complaint was. They told us these men had no food and were angry they weren’t on this list. We stood there helpless, unable even to explain that we were just along to visit. To VISIT! To witness! We stood in front of them saying back, “I’m sorry, I can’t help you.” To say it was heartbreaking would be an understatement. I nearly had to walk away, up the road a little, to break down. Jonah here: After a week of a lifetime’s worth of adventure in Pokhara, Anju and I returned last night to Kathmandu to meet up with our new teammate, Dr. Norman Christiansen. It is time to get started on the next leg of our journey. We left early this morning for the Chandbagh School, headed up by the enthusiastic and patient principal, Bhushan Gurung. As is often the case, the school had been badly damaged during the earthquake with construction all over the place. Students were working in two makeshift classrooms under tarps in what otherwise appeared to be half of a play area. We were instructed to run our playshops in the open space next to that area. While we were initially hesitant, we quickly learned that the gym teacher was also running activities right next to us with noise and distraction par for the course. Today we ran 7 playshops for groups of about 40 kids ranging in age from 6 thru 14 years as well as 2 groups of about 25 teachers. To be perfectly honest, this whole process has been challenging. On the one hand, I am happy to work with as many kids as we can reach. On the other hand, sometimes I feel we must do more - like it’ll never be enough. And if we’re not training people, not replicating ourselves, it’s not enough. So far, we’ve succeeded in training Deneen, Anju, and Jennifer from our first Second Response team in Nepal as well as a group of teachers at the Campion School; at least up to a point of running their first group together with our help. Of course it’s been a pleasure and a privilege to experience the unique quality of each group participating in a playshop as they progress from new, curious circle to grounded, united, calm family. That said my ambition here is to train people and leave capacity on the ground. So when we arrive at a school where we’re put in front of kids with nobody along to “practice” or “observe,” I feel frustrated that we didn’t do enough to explain ourselves or set it up clearly as an opportunity for practice and knowledge/skill sharing. It’s further disheartening when I find myself in a position of voicing my wishes for it to be different to the principal who is obviously juggling much more than my own (selfish?) ambitions. So, it’s complicated. I’ll never know if I’m doing enough… or maybe better put, I struggle to feel as if I’m doing enough - and that discomfort probably isn’t all bad. It was certainly a good day of practice for our team and we reached hundreds of children with the playshops. We returned home exhausted but eager to keep refining our process to be as effective and far reaching as possible. During this period of team rotation in Nepal, when 2 members of the first group returned to the US last weekend and as the second team assembles in Kathmandu, please join us in thanking Anju, Deneen, Jennifer and Jonah for their stamina, dedication, efforts and attentiveness to the many children, their teachers and caregivers with whom they interacted during their time together in Nepal. Some of the locations were quite remote requiring several hours of various means of transportation and walking at high altitude to reach their destinations, and then, once arrived, have the strength, nerve and compassion to play vigorously with children to evoke the desired laughter, facial expressions, noises and movement for emotional release and healing. Note that all over Nepal, regardless of the type of school (public or private), children dress in a uniform. For some, the uniform may be their only clothes. Just because most of the children photographed have uniforms doesn’t mean that they’re in privileged schools. The first Second Response team visited a variety of schools and orphanages depending on schedules, requests and arrangements made by local Nepalese organizations such as the Chaudhary Group, Childreach Nepal, Common Youth Stand Up and Act4Quake, a part of AYON (Association of Youth Organizations Nepal). Madan picked us up early for a full four (turned into five!) playshop day. A part of the Chaudhary family of schools, this local boarding school has over 700 students and we were, frankly, confronted by the potential onslaught of group after group under the hot sun with no end in sight. The saving grace of this potential overwhelm was that we would have a group of teachers with us, throughout the day, training to do playshops on their own. We were graced by a shady rooftop venue and the teachers joined us at the beginning of the first playshop. Jennifer ran the first playshop, a delightful and giggly time. Deneen ran the second with another classic dog howling moment. And Anju made the third playshop beautiful with her own growing brand of flair. Between each group of kids, we played some games with the teachers and debriefed the accumulating knowledge about the flow of the exercises. On each next meeting the teachers seemed to be growing their understanding of what we were up to and, by the end of the third playshop, they were asking some more specific questions and seemed eager to take over. Jonah jumped in for the fourth playshop and narrated the steps to the teachers as he went through them with the students. The teachers watched and nodded with understanding. After a delicious lunch of traditional Nepalese food, we returned to the rooftop where, following some warmup games and some more detailed instructions, the teachers who had spent the morning observing did a courageous and wonderful thing: they collaboratively ran a playshop together, for the first time! While the whole thing was absolutely beautiful, there was a particularly powerful moment in the end when all the teachers were standing in a circle in the middle, facing their students and breathing deeply and slowly, modeling the grounding exercises they’d returned to throughout the playshop they ran. When the students left, the teachers were ecstatic. They hugged each other and high fived us all. We ended the day with some words of encouragement: mostly that they already knew everything they needed to know, they always did, and that the kids were as lucky to have them as they were to have each other. It was a very special day - not only because we left real capacity on the ground here in Nepal, but because it was Deneen and Jennifer’s last day here. The team grew surprisingly close over this short span of time and we’re all pretty sad to see this part of the trip come to a close. We ended the night taking our driver, Madan, and his family out to dinner in Thamel, a bustling neighborhood in Kathmandu. Anju and Deneen ate spaghetti, Jonah and Jennifer ate traditional Nepalese dinner, Madan had his favorite, Dalbhat, and Madan’s grandson had Coca Cola. Sharing food with new friends has been a highlight of the trip - from our visit to Jennifer’s sister’s recommendation, the Yak restaurant, to the beautiful home cooked meal at the RST Orphanage, it’s all been very special. Despite losing a few centimeters in the earthquake, Mount Everest remains the highest peak on the planet and, supposedly, on a clear day, you can see it from Kathmandu. Though we haven’t caught a glimpse yet, Jennifer and Deneen leave with tomorrow’s sunrise and, hopefully, they’ll get a nice peak. Whatever they see as they fly out, Anju and Jonah will be thinking of them and sending them love and gratitude for the hard work and friendship we all shared over the past 10 days. For now, blog’s going dark for a few while Jonah and Anju head to Pokhara, Anju’s home city, for a little break. Thanks for reading, and for partnering with us and the work we’re doing out here to bring a little light to a beautiful place facing a hard time. Today was a scorcher: clear, sunny, and quite warm indeed. We returned to OPAL higher secondary school to play with the classes we didn’t have a chance to meet on our last (rained out) visit. 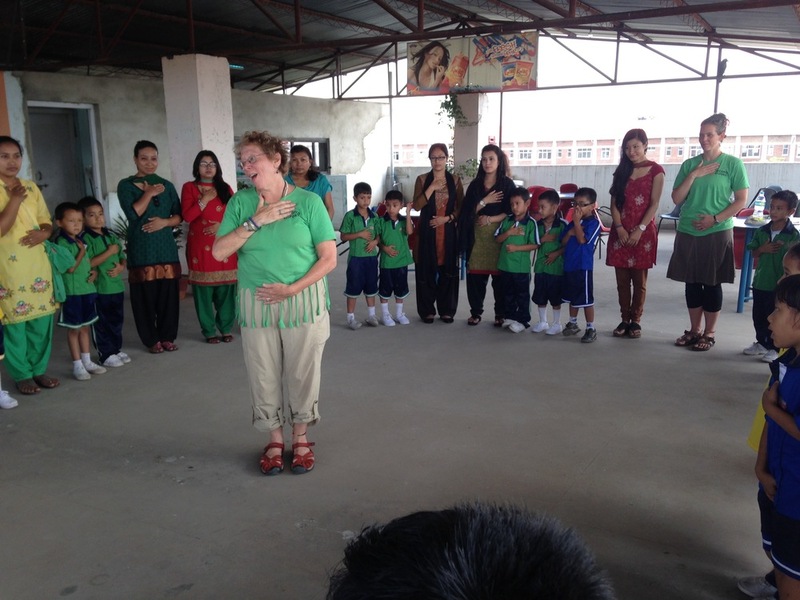 We arrived early in the day and watched the children do their morning exercises, standing in straight lines in the courtyard and reciting the Nepali National Anthem as well as practicing some marching and standing to attention at the Principal’s commands. We couldn’t help recognizing what a fun contrast our playshops would be! Jennifer ran her first PLAYshop today and it was fantastic. The 8-9 year olds that joined us had a real treat with the innocent, curious and joyful way Jennifer set about exploring the group. It’s been a real joy to watch everyone develop their own style and come alive in the unique experience of inhabiting the middle of the circle. Deneen ran the second one under an increasingly hot sun, again proving herself queen of the Boo!/Aaaaah!!! Then a surprise guest volunteered to run the third playshop: Anju! Anju courageously stepped into the circle as the third group joined us in their playground. The kids loved her and it was particularly special to have a native Nepali at the helm. Another sweet surprise was a particularly silly laughing, panting, howling-dog moment. We took a break to escape the heat of the midday sun during which Deneen had some really sweet playtime with some toddlers in the playground and Anju and Jennifer relaxed on the couch in the Principal’s office. We returned after lunch for a fourth and final group effort in which Deneen and Jennifer shared a playshop with some enthusiastic, one might even say rowdy, boys. Jonah here: I finished the day feeling extremely proud of the team for their courage, vulnerability and hard work. It takes a lot to do this work: to move into the unknown, to facilitate emotional expression, to allow groups to grow and move and make noise and to hold a space for chaos and harmony all under a hot sun in an unknown land. My proverbial hat is off to my team today for incredible growth and accomplishment. I’m even more inspired to continue training locals as I can see it’s really possible to empower others to carry on this hard work of play. Jennifer here: In addition to doing the playshop, it really was rewarding to have the respect and thanks of the administrator and teachers. It was notable that in the first groups we work with, teachers joined and observed the students and as the day progressed, they just sent them in to play with us. We suppose it was a combination of their trust in us and their taking advantage of an opportunity to take a rest. We’re happy for both. Anju here: I felt alive. And at some point I felt like I was a part of the children. I didn’t feel like I was making them do things. I felt like I was with them and we were doing things together. And I liked the howling and how they let out everything that was inside them with that noise. I loved seeing them laugh and smile and be themselves. I loved how they played - like they were supposed to. And I enjoyed being a part of something that I learned - and I am very grateful for it. Thank you, everyone, for making this possible. According to the ancient teachings of the pirke avot, if you invite someone to eat fish for dinner, they eat for a day; but if you teach one to fish, they eat for life. Today, we led a PLAYshop training to 15 interested and eager staff and volunteers from Childreach Nepal. Jonah paved the way of illumination, education, inspiration and play in a 4-hour PLAYshop training containing both physical and didactic elements which went by very quickly. We were greeted with open minds and hungry bodies; men and women excited to develop PLAYshop skills to potentiate what takes place at their temporary learning centers, serving the children post earthquake in Kathmandu and surrounding communities. In a very short period of time, the group shared how connected and calm they felt. Having shared the common experience of our morning PLAYshop training, which is all experiential, after lunch break people asked why they felt like crying during one of the exercises? One inquiring mind wondered about the importance of PLAYSHOP skills. During the afternoon “didactic” session, the environment of questioning and sharing was one of safety, trust & acceptance. Second Response team feels positive about what took place today. We feel confident that our participants will be fostering resilience and holding one‘s space amidst suffering and recovery. They are excited to participate in further training before we leave Nepal. Jonah made us proud today. He is an awesome teacher and facilitator and we are blessed to be part of this journey with him. Today offered a distinctive contrast to yesterday’s orphanage - uniforms, a playground, classrooms, a trophy room! All children have a right to play, none more than any others, but it was still impossible to ignore the different levels of access between one group and another. Today was special because, for the first time, Deneen took the lead and ran the PLAYshop all the way through and, Jonah here, she was excellent. I couldn’t be prouder. She had their undivided attention from the moment they entered their playground and she held them to the end. A highlight video is posted on Facebook (or below?) wherein she divided the group in half and one side yelled, “Boooo!” as if surprising the other side and scaring them. The other side yelled, “Aaaah!” threw their hands up in the air and were physically blown back by the energy of the “Booo!” We could have done that all day. It was hilarious. When we finished, just like yesterday, it started to rain and we retreated inside. We had hoped to do a few more playshops but will have to return for more groups later this week. Later in the afternoon, we visited two very special world heritage sites, a Hindu temple called Pashupatinath where we met some very special Sadhus and some very friendly monkeys, and a Buddhist Stupa, the largest I’ve ever seen, called Boudhanath where we walked around the giant structure spinning prayer wheels. Tomorrow we’ll meet with and train the group assembled by Childreach Nepal. We’re all looking forward to the exciting opportunity to share PLAYshops with adults and build more capacity on the ground. Today we drove to RST Orphanage Nepal, an amazing eco-friendly orphanage on the outskirts of Kathmandu, neighboring a brick factory. They welcomed us with beautiful handmade signs and ushered us into their courtyard area where, once we had a tarp up for shade, we dove straight into a PLAYshop. As we found our way through the ending moments, calmed and open, full of “thank you,” and “you’re welcome,” full of gratitude and reflection, we moved the circle closer, shoulder to shoulder, and breathed slowly and deeply together. The second we opened our eyes and completed the circle, the sky opened up and it rained as hard as I’ve ever seen. As we scurried into the classroom/dining room/playroom, a few children grabbed buckets, barrels, and pots and placed them outside to catch clean water as it came off the tarp. Amazing, we thought. Inside, we ate biscuits and drank tea and soda. After getting settled and nourished, Jonah went for a walk with Suresh and got a tour of the facilities. The roof and water catchment set-ups were a highlight; with solar water heaters on the roof, water management from the roof all the way down through the fields, and tons of smart planting, not a drop goes to waste. Meanwhile, Deneen and Jennifer played more games with the kids in the courtyard, including lots of stomping and splashing, now that the rain had stopped, and Anju enjoyed a full concert with guitar and singing! Jonah here: on the roof, I got to know my new Nepalese brother, Suresh a little more. We are the same age and he has been the father figure of this place since he was 21 years old. He was heading for a degree in Microbiology when the need arose back at this orphanage, where he grew up with his mother. He returned and took over; but he still loves science. We looked down from the roof at the kids and he told me each of their stories, when they got there, what they were like. He pointed to one girl, telling me how she had only been there a few months and hadn’t smiled since the earthquake. She was laughing and splashing in the water as it cascaded off the roof where 4 inches had accumulated in the rain and was funneling out one spot into a well spot on the edge of the courtyard. He told me he thought what we are doing is “emotional medicine.” It was humbling, to say the least. I looked at him and said, “Suresh, you’re a hero.” Mutual respect feels good. Back on the ground, I found the team learning some new magic tricks with scraps of crumpled up paper. Yes, their magic show consists of crumpled up pieces of paper. It’s awesome. These kids are incredible. I actually went back to my hotel room and practiced a trick I learned. For real. Jennifer here: being at RST orphanage was a game changer for me. overused term, but really fits. when we moved out of the heavy rain indoors, I was lovingly adopted by several teen girls. I had so much fun with them; they danced for me, they sang for me, I danced for them. They braided my hair, we al fell in love. It was all so simple and so lovely. My heart was so full, I could not speak when we had our final circle goodbye ( for those who know me, quite unusual!) I was crying so hard and trying not to. One of the teen girls, who held my hand most of the afternoon, repeatedly told me not to cry. When I retrieved my voice and stopped “leaking,” I explained that my tears were not of sadness but of deep joy and gratitude. It was an amazing afternoon and it was extremely difficult to leave. I am inspired to sponsor some of the girls. Anju here: I grew up around a lot of children. Some had moms and dads some didn’t so my house was like a home for those who needed it. I had so many brothers and sisters. And going to RST brought back a lot of memories.I saw a lot of smiles and I saw hope in the children eyes. Those children individually had different talents and i enjoyed how they connected with each other. We got there, conducted our playshop. After the playshop, we played with the children and they were very welcoming. Suresh called me his daughter so at RST it felt like home. I have beautiful memories now, brothers and sisters. And I am definitely going back. Deneen here: a place like no other, the orphanage sat high on the hillside overlooking the valley of Kathmandu. Aside from the big brick-making smoke stack, the valley was lush and green and richly care-taken, noticeably contrasting the dense, dusty streets of Kathmandu. I was in awe of the sense of peace here amidst the many joyful, busy children. There was so much love in this large home. I felt it in the children and how they looked after one another, in how their home and how it was respectfully resourceful and efficient and with the abundance of generosity and love shared with each of us, their new family. I will never forget sharing songs with the boys and girls as we waited for the rain to stop and later stomp splashing in the water drenched courtyard until the children and I were fully soaked with joy. Unforgettable! Today, armed with bag lunches and pencils, our gracious driver Madan took us an hour & a half outside the city to the remote village, Sindhupalchowk to visit the Bair Nahadev School. As we approached the village where the school is located, we learned that the roads were washed out - not suitable for the car - so we’d be taking motorbikes the rest of the way. The teacher, Ragav Ja, and a volunteer, Abheneet, arrived on motorcycles and made two 15 minute trips along treacherous, bumpy roads with incredible views, getting us almost all the way to the school. The last 5 minutes of the journey were made on foot, down a beautiful path, across a river, past rice paddies and oxen, into the valley. In stark contrast with yesterday’s relatively well-appointed urban boarding school, the Bair Nahadev School was simply two open-air concrete rooms with two classes of children, a younger class and an older class, ranging from what appeared to be about 3 years old to 12. Unlike yesterday’s group, in their school uniforms and book bags, these kids had nothing. I mean no shoes, no food, no homes, nothing. Like, after, when they got a snack, the only food they’d eat that day, it was a single cup of puffed rice. That kind of nothing. They had also been waiting for us for a while; we are not sure how long. They were resistant at first and confused by the invitation to get out of their seats. It may actually be that they’d never seen a freckly, redheaded, fair skinned lady before, or a bearded, red wings on his boots, tubby, white fellow, or a conspicuously tall, smiley, blue eyed Viking woman. This is entirely possible. Nevertheless, we moved forward and with much encouragement from the teachers and some improvising, eventually got some rhythm in a call and response format and we were off to the races again. While we intended to start with the younger kids, the environment had other plans for us and once we had gathered the tiny students together and made a first little noise, the older kids came right on in and joined. This group was rapt with attention and had a really full range of expression. We could have gone on all day. I think we went an hour, easily, with a few self-selecting 3 and 4 year olds, just getting straight up tired out. Mission accomplished. Jennifer and Deneen, again, had some more practice in the circle, improvising and playing, and making really good lion faces and noises, and we found our way outside and continued, finally ending with some photos and bubbles and a gift of pencils, a very hot commodity in rural schools. After the PLAYshop, in the shade of the office, following a traditional Nepalese thank you of Mountain Dew, Jonah shared one last game for the grown ups: the cup trick. If an upload works, you can see a video. No promises. We all hiked back up to where the bikes were parked and enjoyed a photo opportunity – also shared below (no promises). While Deneen and Jennifer took the first motorbike rides out, Anju, Jonah and Abheneet started to hike back. We drove away in silence with profound gratitude for the opportunity. In our last post we mentioned our meeting with Dr. Tshering Lama at Childreach Nepal. We are proud to be developing training with their staff, volunteers and some local actors. Invited to talk more about PLAYshops in Nepal, we will be guests on the local radio show on Monday. Today, we were invited to NOBS, National Orchid Boarding School in Kathmandu, a facility that housed the families of the earthquake for over a month. Most of the students experienced some form of loss, a family member, and a home… After a quick consult with the school’s principal, we decided to split them into 3 age groups: 4-7, 8-12, 13-16 years. In their courtyard we arranged them in a circle and did what we do! PLAYshops galore. It was particularly interesting in this arrangement to have the older kids look on from their classrooms as each group participated before them. Looking forward to getting out of the city tomorrow. Day one, or four, or twenty four… we’re not really sure. We’re all rather beside ourselves with jetlag. Jonah writing – I left Connecticut 70 hours ago. I only know this because I started my stopwatch when I left home and that was, apparently, 70 hours ago. Following a flight from Delhi, I arrived at the hotel yesterday afternoon, welcomed by a cheery Deneen, Jennifer, and Anju a few hours before dinner and, this morning, after an earthquake wake up call at about 6am, we headed out for a PLAYshop with Common Youth Stand Up and Act4Quake, a part of AYON, Association of Youth Organizations Nepal. This horizontally organized group of young people started four years ago with the goal of holding their government accountable to the people and now has over 90,000 members. When we arrived at their current headquarters, a college, we found them loading a truck with rice, dal, and tarps to send to a village that suffered devastating losses in a landslide just a few days ago. 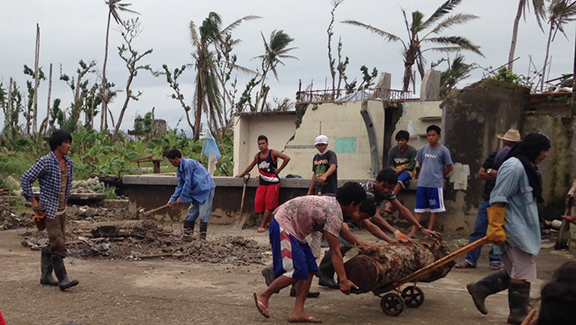 It will take them two full days of driving to reach this village with much needed supplies. At their invitation, we organized them into a circle in the shade and began to play some games and make some noise. This group engaged with ease and took to the games as if they’d played them before. Jennifer led a crowd favorite, “Sneaky Sneaky Space Stealer,” while Anju and Deneen supported and after a bit more low stakes circle gaming, I transitioned the group into a longer form game, the PLAYshop they’d asked for. Nepal is beautiful and dusty. Everyone says Namaste like we say hi. We met Dr. Tshering Lama, an awesome guy with Childreach Nepal and will share more about our extensive plans tomorrow. Second Response board chair, Martha Hackett, MD, and William Spear, founder and president, will talk about the unique work of Second Response and give the latest reports of our teams’ progress in Nepal. The first team lands in Katmandu on June 15 and will be rotated by a second group in early July, including Dr. Hackett. There will be time for questions and discussion. When first responders leave after the initial emergency phase of a disaster or traumatic event, many communities are not prepared to help children overcome the Post Traumatic Stress that emerges in the weeks that follow. Innate, natural resilience makes it possible for most children to recover from a traumatic event with simple loving presence and support; however, most children will benefit from participation in exercises that engage body and mind in fun-filled, expressive sessions. Second Response's 4-hour PLAYshop training will take place in Litchfield, CT on Saturday, April 18th from 1-5 pm where adults will be given an understanding through somatic movement and didactic presentation to conduct non-verbal, carefully crafted PLAYshops that help reduce the incidences of PTSD. This course is open to parents, teachers, healthcare practitioners, emergency personnel and anyone who cares about the well-being of children. There is no charge to attend the workshop for CERT members, Medical Reserve Corps members or Region 5 Emergency Services Personnel. There is a $20 fee for the general public. The training will take place in the Community Room of the Education Connection, 355 Goshen Rd (Route 63) in Litchfield, CT. ** Please register in advance by writing register@secondresponse.org or calling 860-567-8801. William Spear, Founder of Fortunate Blessings Foundation and the Second Response Initiative, and Second Response team members were at the conference to provide information about our work and to offer a special session on the Second Response methodology. Mr. Spear was the keynote speaker of this conference in 2013. The one-hour PLAYshop introduction was conducted by William and Jonah Spear. The learning objective of such a session is to introduce the phenomenology of trauma and Post Traumatic Stress (PTS) to participants through specific exercises designed to prevent Post Traumatic Stress Disorder (PTSD). A PLAYshop training directly engages participants in our experiential methodologies which employ body or somatic exercises to release repressed emotions. The video on this website’s Homepage describes our work and shows scenes from an actual PLAYshop training. Contributions made during the 24-hour period helped Fortunate Blessings Foundation win bonus matching funds and grant prizes donated and secured by the Connecticut Community Foundation of Waterbury Connecticut as part of a nationwide Day of Giving honoring the 100th anniversary of community foundations. Thank you for all you do to support our work to benefit the well-being of children! Numerous presentations and panel discussions were organized around the theme of the Conference. William Spear’s subject was “Preventing PTSD in Children with Body-Centered Exercises after Natural Disasters”. He was also a member of the “Response and Recovery Effort” panel. When the disaster relief teams have left, and families and children must deal with the emotional stress of a disaster, Second Response teams go to work with the children, to tend to their inner landscape. 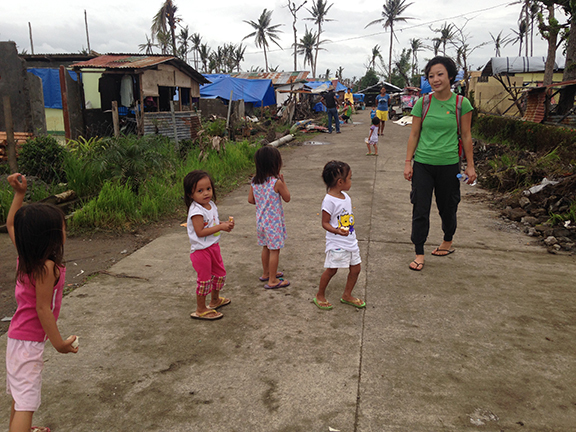 Ellen Goldsmith, of Health Currents Radio interviews Dr. Michelle Wang, clinical psychologist who recently returned from Second Response's trip to the Philippines following the devastating typhoon. There Jonah Spear, Dr. Wang and Dr. Rony Berger worked with children to release the after effects of trauma through PLAYshops. Click on the picture below to listen to the pod cast. Early this morning, Jonah and Rony headed to Saint Thomas University, the oldest in the Philippines, to begin a two day workshop with psychologists, students and staff there. We were greeted by the director of the Philippine Association of Psychology and ushered to the presentation room. There, we found a traditionally shaped lecture hall with seats fixed to the ground and facing the front of the room. Rony and I looked at each other and agreed, after some maneuvering, that it would work well enough, and we began to strategize ways to get people out of their seats just the same. This meant working with the circle with many chairs between us; not my favorite obstacle. Luckily, a number of the participants in this group were actually also in the first group Michelle and I ran at Rizal Technological University on the first day! So, they were ready to jump right in and able to help keep the room engaged in the PLAYshop. 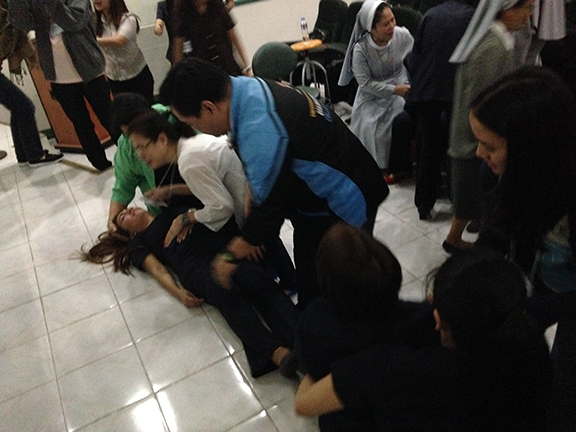 Rony ran most of the day, culminating in a mock emergency exercise in which some participants acted as victims while others acted as caregivers in a chaotic, often dramatic event. We then discussed the events, piece by piece, and came to a greater understanding of some best practices in emergency trauma circumstances. As the next day was to be my last in Manila, I elected to take a day to look around and prepare for my departure. Michelle had intended to work with a group of kids but those plans had fallen through at the last minute, as they sometimes can, so she and I took some time to debrief and let Rony complete his presentation without us. We left the hotel at 5:30am for the airport and arrived there to find virtually none of the sort of infrastructure we might have expected at an airport. We had arrived at this same place but, I suppose, hadn’t paid much attention to it as we were trying to find our hosts in the rain. Now we could see how it was pieced together with cardboard signs and everything, check-in, bags, payments, security, being done by hand or on one of two computers sitting on a makeshift table under a temporary florescent light. 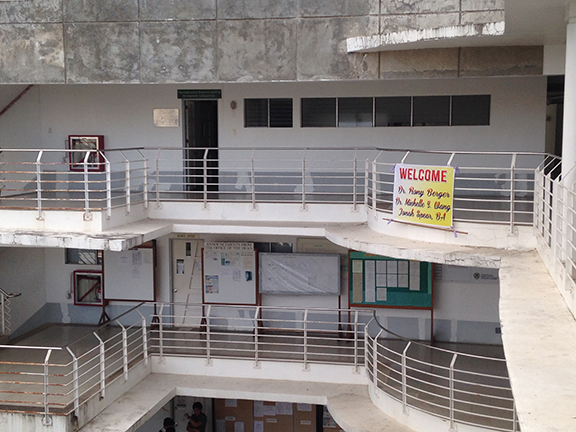 We flew to Cebu to join Rony at another workshop at the San Carlos University and were welcomed by another banner. All our Filipino academic hosts have been especially good with welcome banners and certificates of completion - not to mention wonderful gifts of chocolate covered mangoes! We found the group already working in a circle with Rony and joined right in. Rony’s workshop was practiced and thorough; using a power point presentation, he walked students through specific skill sets for trauma relief and gave real examples from his extensive experience. Michelle and I ran a PLAYshop after lunch which was very well received, especially after the day of warm-ups and contextualizing that Rony had offered them. That night, we flew to Manila and went virtually straight to bed as we all had big days planned. Today Michelle joined members of Kusog at a soup kitchen (and other awesome stuff that I hope Michelle will add to herein) while Jonah went to an education and psychosocial services cluster meeting facilitated by Lisa Deters, the Education Director for Save the Children. Jonah: at this meeting, I shared with the group about the work Second Response does and invited them to share a PLAYshop with me that afternoon. It was frustrating to note that I would be leaving the very next day, especially when I got such an enthusiastic response. There was a significant interest in having Second Response come and train their staff. After the meeting, Dr. Luisa Baurista-Yu and Corazon Abella, the Director of the Department of Education for the region and the Chief of training and development approached me and asked if we could run a PLAYshop and followup training that very same afternoon for the entire staff of 100 people. I reached Michelle through our friend Rikki, at Kusog, and we were able to assemble just a few hours later. After Michelle and I met up at the hotel for a quick lunch and debrief, we hopped in a motor-tricycle past miles and miles of destruction and rubble to the Department of Education where we found the entire staff sitting and waiting for us. Michelle took command of the space immediately and invited them to open their minds to a new experience, to move their chairs aside, and make a big circle. They readily and happily agreed and, within a minute, were standing in a circle, virtually shaking with anticipation. We took to the middle, both of us because it was such a large group, and began our process. We felt an immediate connection with the group, we shook out a little tension before we began the rhythm, and then it really took off. As is often the case, anger and yelling was a very popular part of the PLAYshop and while each group has a different personality, this one was special particularly because of their participation near the end of the exercises. At that time, as we brought them back to themselves with some focused breathing and checking in with their bodies, Michelle asked if there was anything anyone might like a little more of. A woman raised her hand, walked to the middle of the circle and proclaimed, “I want to cry some more!” So we did. We all joined her and wailed intensely until it began, again, to subside. Then, a man stepped forth and yelled, “I want to laugh some more!” And we all laughed our way back to a calm closing place.